There are several bosses in Flinthook, a 2D platforming roguelike (roguelike-like? A game with roguelike elements? ANYWAY) by Tribute Games that is out today for computers and consoles. Seven hours in I haven’t beaten the first boss, but I’m having a great time anyway. You play as the eponymous tiny masked pirate, boarding a series of space ships to steal treasure and fight bad guys on your way to confront end-level bosses. 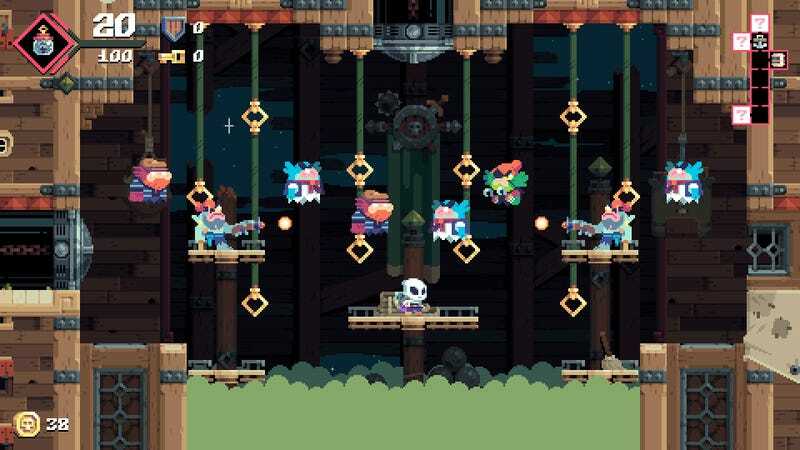 Flinthook has a gun to blast his way toward the bosses, as well as two unique accoutrements: a belt that slows time and a grappling hook to swing around the level’s architecture. 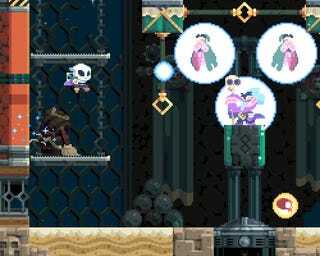 Combined, these two elements are an interesting twist on platforming. The grappling hook isn’t physics-based; you don’t have to deal with momentum or trajectories. Flinthook zips and swings accurately around the level, outmaneuvering the AI. Slowing time lets you move tactically. You can grapple above enemies, take a few pot shots, then slow time and navigate through their bullets as you swoop away. This can be a lifesaver in harder rooms, where enemies and environmental hazards can pile up fast. Ships are made up of a maze of rooms, the layouts and content of which aren’t revealed until you enter them. Sometimes they’ll have treasures; other times they’ll have waves of enemies who teleport or shoot or explode or throw knives at you. Sometimes they’ll have a mini-boss, like a caterpillar-like creature who poops explosives or a jerk with a rotating laser beam. Ships usually feature shops, where you can spend coins you’ve collected on health-boosting items or gameplay-changing perks. One room in each ship houses a treasure chest with a ghost gem inside that lets you leave the ship and move on to the next. After collecting a set number of gems you can fight the boss. There are lore collectibles and relics you can find as well, but all of this is flavor atop the core gameplay. Slowing time will make those pink bars disappear. It’s...complicated. Perks can make some of these rooms easier. Perks are powers you can equip through runs, either temporarily by finding them, earning them as you level up across lives, or by purchasing them at the black market and equipping them in limited slots. I’m fond of the three-slot perk that makes you fall slower, as well as the two-slot perk that gives you a health-boosting apple at the start of each ship. Other perks unlock bomb types, help you run faster, or give you more XP. Switching perks hasn’t drastically changed my experience, but they’re nice complements to however I naturally play. I’m not very good at avoiding damage, so I need all the health perks I can get. A shop. The shopkeepers and other non-enemy NPCs have great design. While this all seems like a lot to explain—not made easier by the game’s obscure lore and retro obtuseness—in practice it’s seamless. Flinthook is fast-paced and satisfying, made moreso by its pounding 8-bit soundtrack and blocky pixel art. There are obvious nods to modern roguelikes such as Spelunky and Rogue Legacy, but not in a derivative way. Flinthook embraces those games’ difficulty and consistency, and as such my current failure to overcome the first boss feels very much like my failure. I can only assume future bosses are harder, but the first levels are already quite hard enough for me, thanks. A pretty easy room, all things considered. As in Spelunky, I can easily pick out where I went wrong: I didn’t prioritize a certain enemy type, I didn’t play defensively enough, I panicked and just kept jumping on those damn spikes over and over. I’ve snarled at frustration at Flinthook, but it’s always been at myself rather than the game. My attempts never get old or feel unfair, and it’s easy to jump into a new run the moment I fail. The moment-to-moment gameplay is fast and legible, satisfying enough to sustain the multiple tries roguelikes require. Progress is a matter of skill, quick thinking, and learning from your mistakes. I’m not dissatisfied with my lack of progress (I am a little embarrassed, however). Fans of bullet hells will probably progress much faster than I have. So far Flinthook is the right amount of hard, and I can see it entering my go-to roster of games alongside some of my other favorite indies like Gonner, Teleglitch, and Heavy Bullets. It’s lighthearted, colorful, and tough but fair.